FORMULA 2 CLEANER/PROTECTANT – No more oily, greasy film! No more tire rot! No more vinyl decay! No more damage! 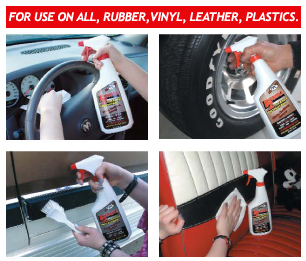 Our FORMULA 2 is completely different – unique – it thoroughly cleans, then totally protects all rubber, vinyl, even leather surfaces! PPC’s specially-developed water-based polymer formula cannot attract dirt and dust. FORMULA 2 keeps everything looking “new”! When you use this product, you will see what “quality” means. One of our top sellers since 1982! Restores vinyl to original beauty. Dries non-greasy - leaves no "oily" film. Long term protection prevents weathering & rot. Preferred Exclusively by NASCAR Enthusiasts! Does not attract dust - surfaces stay cleaner, longer. Widely used in the plastics manufacturing industry.